Description: Pourable, anchoring cement, 15 minute set. Non-staining. Anchor railing, bolts, ornamental iron. Description: Dry cementitious blend that when mixed with water, produces a pourable or pumpable, self-leveling floor underlayment. Light duty wearing surface. Level, smooth or resurface damaged, spalled or otherwise rough and uneven surfaces prior to covering with other finished flooring. Description: Extremely high flow cementitious grout. Contains flow modifiers to allow it to almost self-level without the addition of extra water. 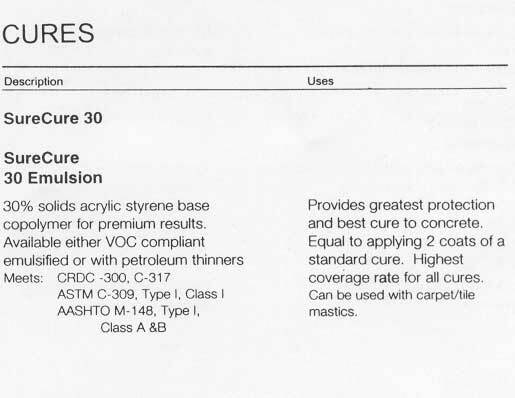 Description: Fast setting, adhesive modified compound for concrete floors. Use to level and smooth floors prior to tile and carpet installation. Provides greatest protection and best cure to concrete. Equal to applying 2 coats of a standard cure. Highest coverage rate for all cures. Can be used with carpet/tile mastics. Description: Pure iron aggregate for making metallic grout on the jobsite. Use wherever metallic grout is desired to be mixed in the field. Description: Ready to use metallic iron grout. Develops over 8000 psi. Use fluid, dry pack, or regular. Grout beds, column and base plate. 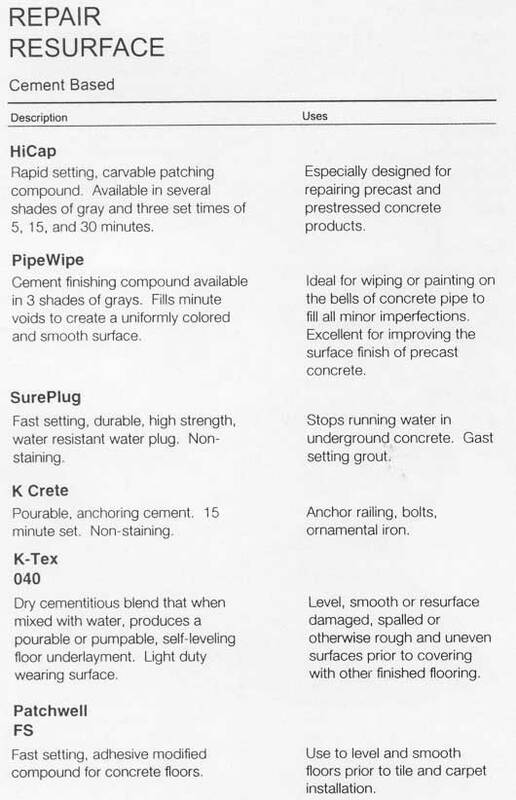 Description: Cementitious, water-displacing, self-curing, non-shrinking grout. Very high strength. Ideal for use underweater in pile jacketing or structural marine repairs. Description: Premixed, dimensionally stable, non-shrinking, non-metallic grout. Cable ducts, horizontal joints and grouting beds between members, anchor bolts, dry packing joints, column grouting, base plates. Stops running water in underground concrete. Gast setting grout. Description: Factory proportioned, epoxy grout. Non-shrink, high strength and chemical resistant. 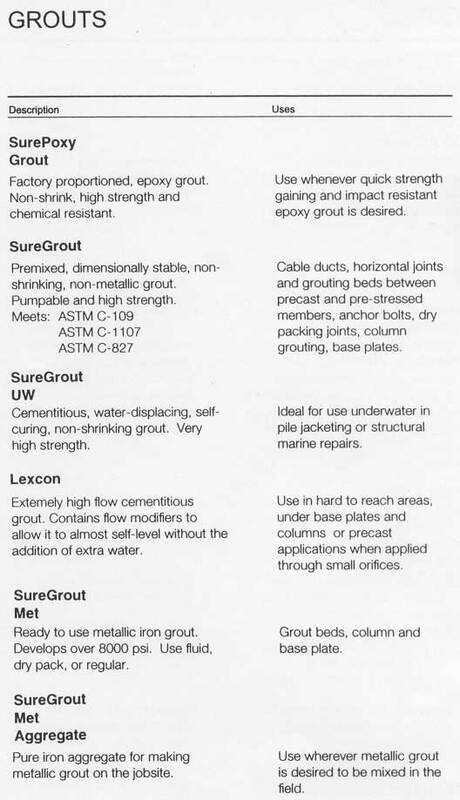 Use whenever quick strength gaining and impact resistant epoxy grout is desired.